BRONEVIK.COM IS OFFICIALLY AUTHORIZED TO ISSUE TOURIST INVITATIONS AND APPLY TO THE RUSSIAN FEDERAL MIGRATION OFFICE (FMS) FOR BUSINESS INVITATIONS. US, Canada, UK, Japan and most of the EU citizens need visa to come to Russia. The list of countries whose citizens are exempt from obtaining Russian visa can be found here. Still we recommend all applicants to contact local Russian Consulate to double-check visa requirements before coming to Russia. Applying for Russian visa you have to choose between Tourist visa and Business visa unless you visit Russia to adopt a child (adoption visa is required), send a child to Russia with a Russian mother (homestay visa), or you plan to stay in Russia over 90 days (student or work visa). The choice between Tourist visa and Business visa depends entirely on the number of entries you need and duration of your stay. A tourist visa to Russia may either be single-entry or double-entry. It gives you the right to stay in Russia for the maximum of 30 days. Some Russian Consulates may only grant a 14 days stay, unless you provide sufficient evidence of necessity to stay 30 days as a tourist. A business visa to Russia may be single or double-entry for 30 or 90 days, or multiple-entry for duration of 180 or 365 days. Please note that only US citizens are allowed to stay in Russia for all 180 consecutive days once the multi-entry business visa is issued. All other nationals are allowed to stay only 90 days within each 180 days period. Neither tourist nor business visa can be extended. You have to leave Russia and apply for a new visa to come back. To get Russian visa you have to prepare a package of documents and apply to the nearest Russian Consulate. The most essential item on the list of documents is visa invitation to Russia. Tourist visa invitation consists of two parts: standard tourist confirmation ("Podtverzdeniye") and a tour voucher. It carries the REFERENCE-NUMBER of our company (which confirms that this company is allowed to receive foreign tourists), personal data of each tourist, dates of trip, itinerary in Russia. The voucher is signed by Bronevik.com authorized person and carry the official seal of the company. Original letter of invitation issued by Federal Migration Service Office (FMS) or by Russian Ministry of Foreign Affairs contains name in full, date of birth, citizenship and passport number of the applicant, name of hosting organization (that is Bronevik.com), reason and period of visit. Invitation must be signed by authorized person and carry the official seal. Double sided completed application form, one per person. Application form must be signed and dated. One professional passport sized photo (3,5 x 4.5 cm) The photo should be glued (not stapled or attached using adhesive tape) to the specially marked place of the application form. 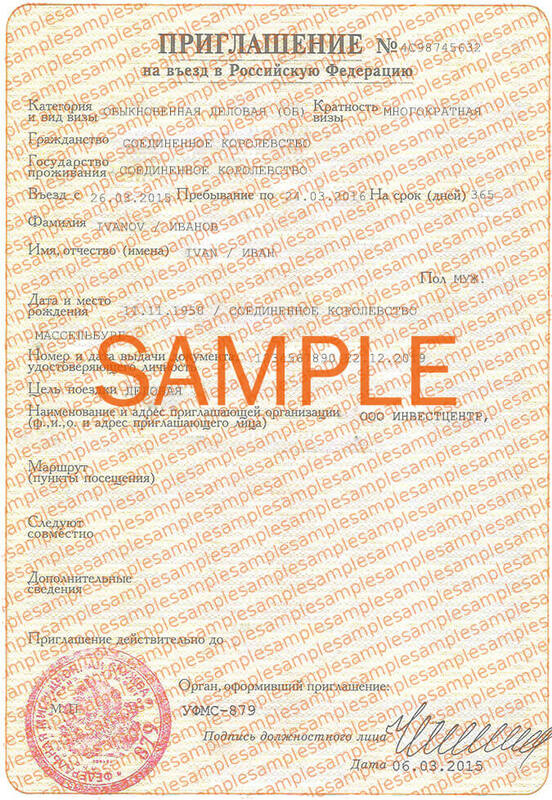 National passport (original) valid for at least 6 months after the intended date of departure from Russia. At least one page of the passport should be free from notes. 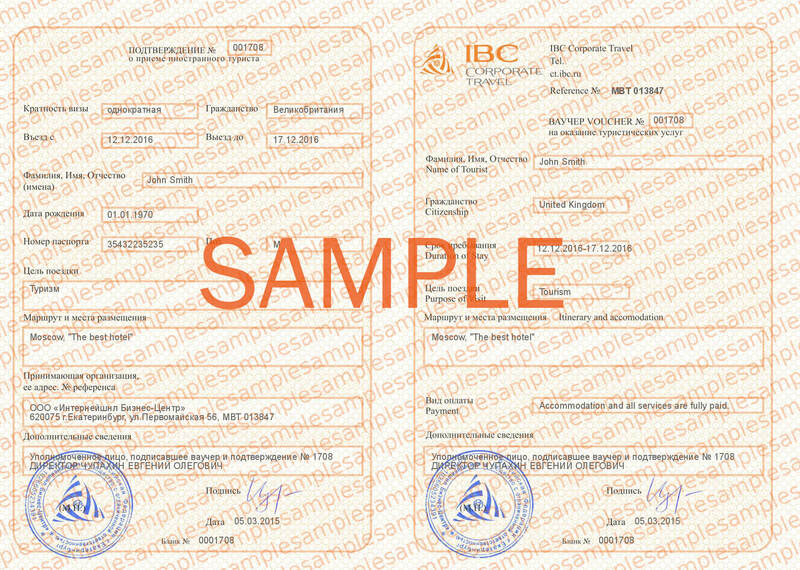 Copy of high quality or original standardvisa invitation voucher. Copy of itinerary (flight details, accommodation). Russian institution to be visited - non-applicable. Tourists are not supposed to visit any organization in Russia. Name and reference number of the tourist group – same as on the invitation. Address of stay while in Russia – as a tourist you should book a hotel in advance. The name of your hotel is stated on the invitation voucher in Latin characters. Please put the same hotel name in your consulate application form. Russian institution to be visited - please indicate the name of the invitation issuer. To see answers for other FAQ click here. VISA SUPPORT FROM BRONEVIK.COM is FAST, WELL PRICED and SAFE!